PHOTO - Ban racing at Richmond this past Friday. 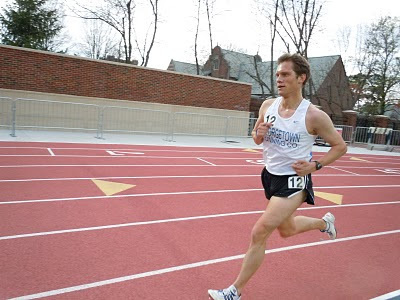 The Wednesday night workouts helped him record a 15:42 for the 5,000m. From Coach Jerry: First, congratulations to Brian Young for a huge breakthrough on Saturday at the National Half. Brian ran 1:16:24 which is a PR of more than 3 minutes. Brian has worked hard for months and this was well deserved. Clearly, some of that GRC magic has rubbed off on him. Well done! Second, don't forget to work your contacts regarding our summer program. I've already received a commitment from a kid who is likely the top distance runner in Maryland so I expect the word is going to get out soon, but keep pressing. This is a great chance to raise some money for the team, so let's not get lazy in our recruitment efforts. Third, for the workout this week, we'll be at American again. The workout has many moving parts, so stay with me on this. The main component of the workout, which those of you who are sharpening up for Cherry Blossom will do, is 2 x 1000, 4 x 500, all of it pretty hard. We'll take a 600 recovery after both 1ks, and 300 after the 500s. The A group will go 70s on the first 1k, 69s on the second, and the 500s will go through 400 at 66, 64, 62, 60. The B group will go 73s, then 72s, on the 1ks, and through 400 on the 5s at 70, 68, 66, 64. Both groups will get going at 7:00. Now it gets complicated. Wiggy and Outlaw will start at 6:45 and do 2 x mile @ 5:00 with a 2 minute rest, and then will do the rest of the workout with the B group. If anyone would like to join them, feel free. We will coordinate the start of the B group workout so that Wiggy and Outlaw have no more than 3 minutes recovery after their second mile rep, so B group, please be ready to roll right at 7. We will also have a separate workout for Dickson and new member Matt Logan (of Calvin College fame) starting at 6:45, which will be 5 x mile @ 5:16, 5:12, 5:08, 5:04, 5:00, (ie 79s, 78s, 77s, 76s, 75s) and any of you who want to join in that are also welcome. Give me a shout if any of this is unclear. See you on Wednesday at AU. Hello all, I am going to volunteering at the package pick up on Saturday's morning and going to G-town store to help a friend to pick out running/jogging/walking shoes. If you guys not really wanna wait in line at the expo, I would happy to help you pick up your package and bring to the store about 12:30 and leave around 13:15 or so. If so, feel free to email me. A number of people have inquired about a social event post-Cherry Blossom. Ideally, the host should be close to "the action" downtown. Grilling perhaps? Any takers? Any ideas? Additionally, is there anyone on the team who would be willing to lend me a bike on race day? I am not looking for a souped up racer (nor clip in shoes), just something that can get me around the course. Brief recap from Chaznasty: "Windy conditions. Ran conservative to draft on another runner who was slightly slowing each lap. I should have went with 4 laps to go. However, the legs feel really good." Nice job Charlie! You are on track for some big races in the upcoming weeks. This has been an exciting "offseason" for the team including some great individual performances and team records, incredible turnouts at our Wednesday night workouts, and behind the scenes preparations for a HUGE 2011! 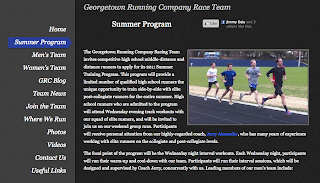 Stay tuned to the blog in the coming weeks for more developments in our new Summer Training Program for promising HS runners, our team's Father's Day 8K fundraiser, and more. But today we're excited to "officially" launch GRCrunning.com! Over the past few months, several of us have been working on enhancing the GRC Race Team's online presence to better communicate to the team, prospective team members, our followers, and our competition. This website is our team's permanent presence on the web and your go-to location for archived results, news, photos, videos and more. It will also be your go-to site for supplemental information about the team including maps to running locations, team member profiles, and useful links. Many of you have already visited the site, and "liked" it on facebook. We encourage you to regularly check back to the site for updates, provide feedback to Jimmy, and tell your friends and family about it. 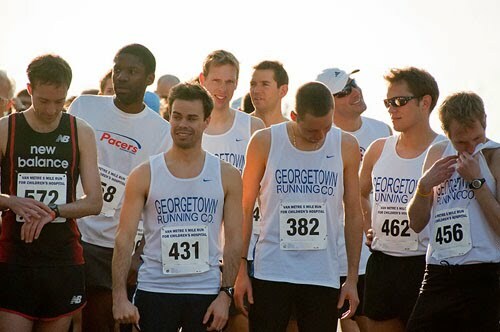 The next time you meet someone interested in our team, just tell them to visit GRCrunning.com or email info@grcrunning.com. At the same time, we're making some small changes to the blog. We're moving much of the permanent information off of the blog sidebar and onto the website. We're also rearranging the most popular sidebar tools to more prominent locations. Now it will be easier to see the weekly calendar of team events, and the latest posts, comments, and personal blog posts. We're also ending the ability to comment anonymously on the blog. The original intent of anonymous commenting was to allow new team members to communicate with the team. However, this change is being made for a few reasons: the new website has information for prospective members on how to join and contact us; anonymous commenting does not enhance discussions on the blog; commenting anonymously is not significantly more convenient than posting under one's username; and anonymous commenting has been abused many times over the past year. 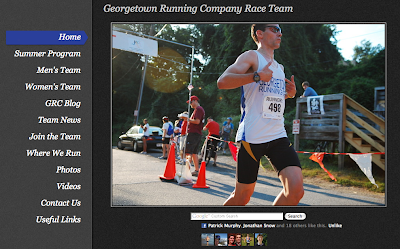 We hope and encourage you all to use the blog as a positive forum to coordinate runs and workouts, celebrate race results, and communicate with the entire team. Remember, many people outside our team see the blog and it's important to remember that every post and comment is a reflection on our team. Finally, let's all take the time to thank Jimmy Daly for all of his hard work to create this new website. 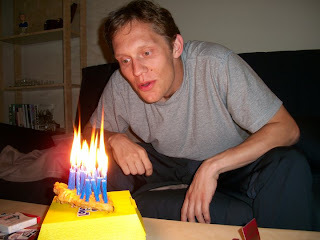 He started months ago by updating over 30 individual profiles, and followed up by putting in countless hours creating GRCrunning.com in his free time. Even vertigo couldn't keep him down! So, when Jimmy is back on his feet and running with us again, please be sure to thank him in person. He'll continue to improve and update the website, and is open to your suggestions. I am NOT running Cherry Blossom, but I figure it might be good practice for the team to run part of the course on Saturday during the Store run (or at least the 6-7 miles of the course). Any takers? This is a reminder that the Wednesday night track workouts will take place at American University this week and next week due to conflicts at BCC. Please plan to arrive at the track at 6:00 so we can get started a little early since there are no lights on the track. Arriving by Metro: If you plan to take the metro to practice, get off at the Tenleytown-AU stop on the Red Line. Post in the comments if you need someone to pick you up from there. The campus is about a mile down Nebraska Ave from there. Arriving by Car: There is some parking on campus, but give yourself time to find a spot on the street if you need to. You can drive onto campus via the entrance on Massachusetts Ave across from the Katzen Center. From there, drive under the student union and find parking in one of the dark blue parking lots on this map. There is also usually parking off campus along Newark Street at New Mexico Ave. Do NOT park in student-only parking or you'll get towed. 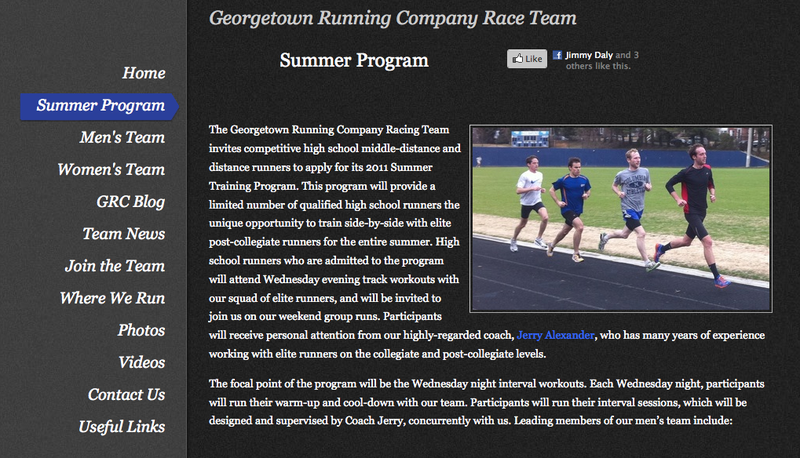 And finally, the workout from Coach Jerry: Finally, the workout this week (and next) will be at American University. There are no lights on the track at AU and they close the track when it gets dark, meaning that the campus police actually come out there and throw runners off (as Ryan can attest first hand), so that means we need to be rolling right at 7:00. To make sure there are no delays, please be at the track at 6:15 for the warmup. As for the workout itself, I want to get in some volume this week, since we will back off next week to have everyone rested for Cherry Blossom. We will do 6 x mile with a 400 recovery. The A group will go 2 @ 5:00, 2 @ 4:55, 2 @ 4:50. The B group will go 2 @ 5:15, 2 @ 5:10, 2 @ 5:05. Once upon a time, Klim and I would meet on Mondays at 6:30 pm for an easy recovery run through RCP starting downtown. Maybe it is time for that tradition to resume? Los Angeles, CA - In weather that sent thousands of people to the medical tent to be evaluated for hypothermia, Arlington's Emily Norton placed 91st in the Los Angeles Marathon in a personal best 3:28:07. A cold, steady rain fell for most of the day, making conditions uncomfortable for the 23,500 runners. Emily, seen here in some other marathon photo stolen via FaceBook, works Saturdays at the Chevy Chase Running Company. WX WIRE: During the first six hours of the marathon, .78 inch of rain fell at Santa Monica Airport. Ankle-deep rainwater greeted the marathoners in Brentwood, and cold, wet winds lashed the finish line. Fire dispatch channels were full of reports of soaked and hypothermic runners, and firefighters called for buses to return to Hollywood to pick up stranded. shivering stragglers. One wheelchair racer flipped his rig on a wet La Cienega Boulevard, but was not injured, KTLA reported. The race started at Dodger Stadium on nearly-dry pavement, but soaking rain and driving winds developed a half hour into the race. I'll take a size 8.5 in a pair of Nike Streak 3's for those flats. and those Nike frees I told you to hold at the store yesterday... you can send those back on the shelf. My man got a different pair. 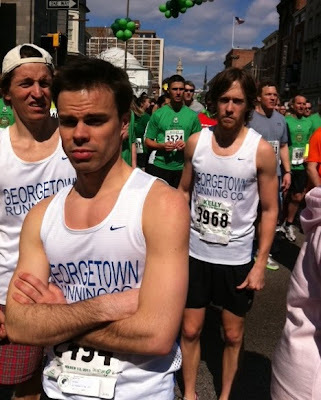 Karl Dusen (seen here wiping his nose on his singlet) ran his best race in a GRC singlet on Saturday morning taking second place behind Olympic Marathon Trials Qualifier David Nightingale at the Van Metre 5 Miler. Karl is rumored to have run a 4:37 last mile in an all out drive to catch the former Ivy league nemesis. 24:03 for 5 miles is equivalent to a 14:30 5k, 30:05 10k and a 1:07 low half marathon. Charlie adds: It was pretty windy, everyone was pretty much out on his own. Luckily for him, Karl wasn't really trying. Mighty Gurmessa took down Mighty Bert and Phillippe Rolly, who was winning races in DC back when most of you were in 8th grade, still likes to run. Jean-Christophe Arcaz, has been running the same times for over ten years and was there. Neal, Jean-Christophe is 21 years older than you and 60 pounds heavier, so I am glad you beat him by 6 seconds. All of this at the Scope it Out race downtown this AM. The run is a point to point from Edward's Ferry to Old Angler's Inn - the distance of which is 18 miles. The plan is to meet at Old Angler's Inn at 8am then commute together in one car (in the clothes you plan to run in) up to Edward's Ferry in one (or 2) car(s). From there you'll run 18 miles straight back to Old Angler's Inn. Once finished, someone will drive the original car back to their car at Edward's Ferry. A second group will meet at Riley's Lock at 9:45am to run the last 10 miles with the group. To celebrate the start of the weekend and to embrace weather in the highs 70s, a bunch of North Bethesda Distance Projecters will be meeting at Old Angler's Inn at 6pm for a run on the trails/towpath. Post/come if you are interested in meeting up. A posse of GRCers + are meeting at Nanny O'Brien's in Cleveland park tomorrow between 5 and 6pm to celebrate all things Irish. From here we'll work our way to a less congested local...likely Cleveland Park Bar & Grill, which has a balcony. Spread the word. All - please update YOUR race results in the GRC Spreadsheet. Race, date and time. It takes but only a moment. Thanks. 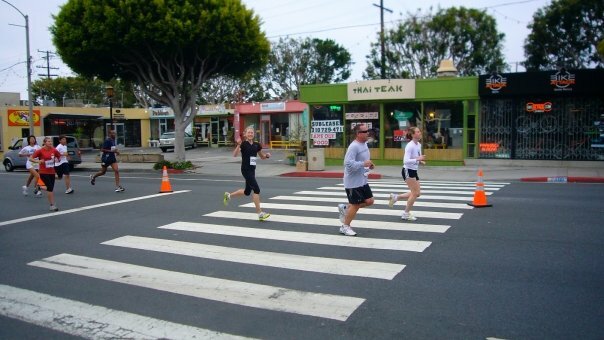 I have a limited number of comp entries for the Pike's Peek 10k on Sunday, 4/17. Please e-mail me if you are interested before the end of the week. Pike's Peek is arguably the fastest 10k around - Luke Watson was the top American last year (29:30ish)...and wasn't even in the money since he finished 12th! So, if you are looking for a PR course, consider this one. We'll meet at the BCC track as usual on Wednesday evening at 6:30 for the warm up. "We'll do a 5-4-3-2-1 ladder, and we'll keep it fairly relaxed, as some of you are recovering from racing, and the rest of you are racing this weekend. The A group will go 75s on the 5, 74s on the 4, 73s on the 3, 71s on the 2, and 68 on the 1. The B group will go 78s on the 5, 77s on the 4, 75s on the 3, 74s on the 2, and 70 on the 1." Guys and Gals - Last year we finished 17th out of 59 in the Men's Open Team Competition. This year, I've signed up Koonce, Hughes, Bain and I. 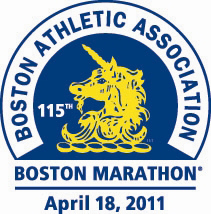 Is there anybody else who has qualified and is registered for this year's 115th running of the Boston Marathon? Are there any women who qualified and are registered? Just a reminder for the guys planning to race to sign up today if possible. The price goes up tomorrow. I know Ryan and Sam are in. Who else will be there? Luff takes Kelly Shamrock 5k in 14:51 . Dirk second in 15:12, Chicken Tender PRing in 15:37 for 5th place, 1535, Murph 8th in 15:48. Mike Cotterell's 16:47 and Scotty Buttwienis' 16:58. Are big PRs! great work!!!! Jerry Greenlaw ran 47:55 at the Gate River Run, splitting 31:40 for 10k, for 48th place. Dartmouth alumnus Ben True 2nd. 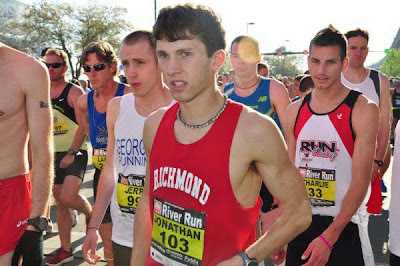 Richmond's(and Arnold,Md's) Matt Llano 23rd, Penn State's (and briefly Maryland's) Tyler McCandless 25, Pacers'/American's Steve Hallinan 33rd, Richmond's Jon Wilson 41st, Georgia Tech's Joey Zinns 55th, PSU's Art Gilkes 72nd. Outlaw will take on the rest of the US 15k championships field, more than 60 invited runners, tomorrow at 8:20 ET at the Gate River Run in Jacksonville. You can watch coverage at http://www.runnerspace.com/USA-15k. Results will be here. Some of the A group guys who are not racing this weekend are going to do a progression run at BCC on saturday. 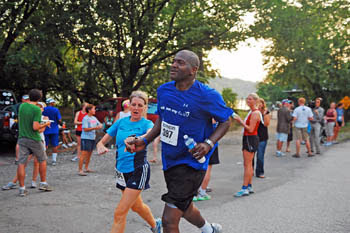 The lucky participants will meet at 9 for the warm up, and get rolling with the run at 9:30. The plan is for a 6 miles total, with mile 1 @ 5:15, 2-3 @ 5:10, 4-5 @ 5:05, and 6 @ 5:00. Ryan is going to do part of it and then hit some 200s after. You are all invited to do any or all of this workout, or to come out and do something else more to your liking. Most of you will not listen so this is a bit of words to the wind. I will say however, that I have seen PTs, CHIROS, stretch and massage gurus and more. All in an effort to fix what should never have been broken to begin with. What has proven to be the saving grace is the simplest and easiest remedy of them all; Focusing on running form and simple running shoes with no HEEL. Get off the big Heels as this creates poor joint and muscle stability and issues down the road. Go to this site and do some reading. Anyone have a favorite physical therapist in DC? My friend is having IT band issues and wants to get everything straightened out before the National Marathon. Thanks! On another note, my foot is still messed up, but it's feeling a little better. I'm optimistic that I'll be out of the boot in two weeks and back at it in no time. The Silent One runs Seneca Creek Greenway Trail Marathon on Saturday, March 5 as a tempo run and finishes in second place overall. I just wanted to let you know we are planning from running at The Line again this Sunday, meeting at 9AM. It should be a great place to run in the rain which is definitely coming. So don't be a wuss and get out there anyway. See you then. I am not sure who is in charge of race admin for this group but I was told by Capital Running Company today that you cannot send them entries for Cherry Blossom as there is a new format for registration this year. Apparently, some folks have been mailing them in and this will not work. You need to register online to get the whole team on board. Go to the Cherry Blossom site for more info. As for the St. Patrick's Day 8k next weekend, I assume some or most of you are running this. 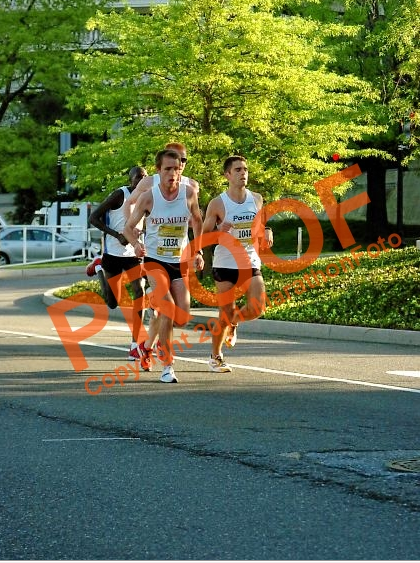 This is the major showdown on Pennsylvania Ave race of the year. Demessa and Gurmessa are running it as is the whole Pacers crew. Heck, this is another chance to bring down Mighty Bert. My money is that Jerry or Dirk will win it outright. "It looks like we're going to have a great night to run on Wednesday, so we'll take advantage of it by working hard again. The workout will be a ladder of 2 mile, 1.5 mile, 1 mile, .5 mile (or as we adherents to the metric system refer to it, 800 meters). We'll take a 5 minute rest after the 2, 4 minutes after the 1.5, and 3 minutes after the mile. The A group will go 74s on the 2 mile, 72s on the 1.5, 70s on the mile, and 68s on the half. The B group should shoot for 78s on the 2 mile, 76s on the 1.5, 74s on the mile, and 72s on the 800. if we need to break into a C group after the 2 mile, we'll do that." If any of you are planning on running Chicago this year, they anticipate selling out in the next week or so. Anyway, there will be some women at this party, which surely must be a draw for many. the party is also down on U st so there is hip/urban culture to escape to. if there is some interest, please comment in the aggregate and I can provide details.